Following the footsteps of the football team’s incredible draft in April, the Michigan baseball team set a program record today with 11 draftees (10 of which came today). If you read my Team 151 Season Review, you’re probably thinking right now that I am an idiot because I did not expect this many players to be drafted, but either way, there they go, a very proud day for the Wolverine baseball family. After being Michigan’s best overall slugger for the past two years, the Braves, who have the best farm system according to Baseball America, selected Lugbauer as a catcher. He has a gorgeous left-handed swing with power to all fields, leading the team in slugging percentage (.518) and cracking two grand slams. He played corner infield for Michigan the last two years but in the few scouting reports that witnessed him catching, he is praised as a solid receiver and pitch framer, though we do not know much about his ability to throw out runners. His versatility and experience playing other defensive positions will help him find playing time as he works his way through the minors. A rising senior, Lugbauer is unlikely to come back to Michigan seeing as he is still on fringe signing bonus territory. He has until August 15 to officially decide, though the Short Season schedule begins in only a matter of days. The Braves are in full rebuild mode, and though positions are harder to project in baseball than they are football, this plays into his favor. They have their essential core of prospects (Dansby Swanson, Ozzie Albies), but throughout the rest of the minors, it’s essentially a three-year tryout. Nutof is a solid rotation guy who pitches to contact rather than to the swing and miss. He had a 1.41 WHIP this season and a .273 opponent batting average, which was a slight improvement from last year’s 1.55 WHIP and .275 opponent batting average. What he will get you is innings and dependability, always important in a rotation of 4 or 5 pitchers. Nutof is sound mechanically, with a long and balanced follow through that allows for easy repetition and with the right pitching coach (Reds manager Bryan Price was a journeyman pitcher who never made the majors), Nutof could turn into a consistent strike thrower. Like Lugbauer, he is a rising senior, and like the Braves, the Reds are a hot mess of a franchise at the professional level and will look for any help they can get, making this a good landing spot other than the notable unfriendliness to pitchers at Great American Ballpark. Wenson chose to return to school after a late round selection in 2016 (.289/.345/.491), only to see his career offensive year fizzle into a frustrating season at the plate in 2017 (.191/.298/.383). Catchers aren’t expected to hit much, but a sub-300 OBP is still alarming. If the Angels can harvest Wenson’s strong frame (6′ 3″, 235) into a league-average hitter, they will be thrilled because he is an advanced defender. A great defensive catcher is rare, so organizations will tolerate lower offensive numbers if they can manage a pitching staff and keep runners at bay. Michigan’s last two seasons of pitching were incredible, and much of that was thanks to Wenson behind the dish. Wenson moved up 15 rounds from last season but couldn’t land in the money in this year’s draft. Nonetheless, he has the body and arm of most big-league catchers which will get him in the good graces of many coaches. The Angels unanimously have the worst farm system in the league, which will allow Wenson to move up quickly should his defense prove its worth. Pall joins his teammate Jaskie as a Mariners draft pick, albeit after an injury shortened junior season at Michigan. Pall served as Michigan’s closer last season and excelled in the role, but went down early after the Seton Hall series and left the rest of his draft profile up to 2016. The Mariners still saw enough potential to pull the trigger on the 6′ 1″ 195 pound righty. Pall faces a tough decision. Should he return for his senior season, the closing role will likely be his to lose, but should he have a rough or another injury-plagued season, his draft stock will take a hit. He obviously has had success in the back end of the bullpen, which is promising for many organizations. I say he should go. Big, big, big Jake Bivens fan writing this article. He’s averaged an incredible .438 OBP the past two seasons, walking and stealing bases at a rate that’s one of the best in the conference. A shoulder injury limited his defense to only first base and he doesn’t hit for much power, but that doesn’t matter if you’re on base almost half of your at bats. If he keeps getting on base, it will get harder and harder for pro teams to say he can’t be a starter. Like Pall, Bivens does have his senior year ahead of him, but I think he’s proven everything he can at Michigan. Capable defender, threat on the basepaths, table setter at the top or middle of the lineup and no dips in production across three years of starting. The Tigers farm system is only marginally better than Wenson’s Angels, so if his OBP can translate to the minors, he’ll turn heads quickly. 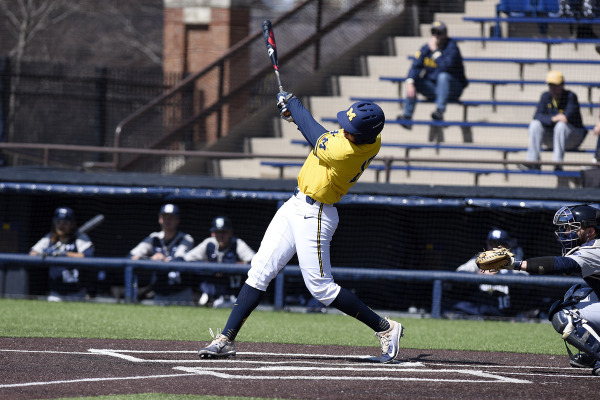 Slater peaked at the right time at Michigan, reporting career highs in almost everything during his senior year as the starting rightfielder for Michigan. He only made one error in 58 starts, 15 steals in 15 attempts, a .370 OBP, and 47 RBI in 2017, but the question is: was this season a fluke or did he finally put it all together? He has a short, quick swing, plenty of speed in the outfield, and good vision at the plate, making him a tough out. Slater’s senior year was magnificent, and I can’t wait to see what he can do on defense on real grass. He’ll join Pall and Jaskie in the Mariners system and will impress the brass if he can match his .370 OBP rather than return to his .270 figure in 2016 at Michigan. Hendrickson’s 4.06 ERA was 2nd-best on the team in 2017, but ERA doesn’t tell the whole story. His 1.3 WHIP was 2nd on the team to Jaskie’s 1.22, and .236 opponent batting average was only 2 points higher than Jaskie’s .234, making him a very close second when it comes to preventing base runners and hard contact (he did allow the fewest extra base hits of any Michigan starter). Hendrickson rose to the occasion when his arm was asked to take on a heavy workload (75 innings) compared to 2016’s 10 innings. I never got a chance to see Hendrickson pitch, but I feel like he had to live in Jaskie’s shadow as the resident lefty on staff. Hendrickson did a wonderful job limiting base runners but could benefit from some more command. The Tigers went with another local product, taking redshirt-sophomore Grant Reuss, who was lethal out of the ‘pen in 8 games and only 6.2 innings. At 6’ 5″, 230 pounds, Reuss should be able to light up the gun and bring the heat on opposing hitters, getting out in front of the baseball with a long delivery lefty delivery. With another two years ahead of him and a promising year behind him, Reuss still has a lot to prove but has impressive intangibles. I think he should stay with the team and play out his role with Michigan to prove that this small sample size of 2017 wasn’t just a result of a small sample size. Talk about lethal out of the pen. Lozer allowed only 3 runs and walked 9 in 27 innings across 25 appearances in 2017, good for an opponent average of .138 and an ERA of an even 1.00. Those numbers are incredible, and somehow improved from 2016’s 2.37 ERA in 29 appearances. Lozer just finished his senior year and the first out of the bullpen, which is what the Mets need desperately. If he can pitch like this in the minors, you’ll be hearing from him very soon. Though I owe Brdar an apology because he went to the Cardinals, he pulled a Johnny Slater and put it all together for his senior season, hitting .310/.370/.409 (incredible power numbers for a shortstop), and fielding .988 with only 3 errors in 59 starts. As a 36th round pick, the odds seem to be up against Brdar, but he’s in a similar position to Harrison Wenson. Shortstops are asked to be defenders first and hitters second (Addison Russell, Andrelton Simmons, Jose Iglesias), and defense travels. Wherever he may end up in the minors, he’ll get lots of playing time simply because he’s reliable and he can get on-base (.370 OBP will stand up to better pitching too). A number of Michigan commits were selected today as well, though most won’t sign: 1B Jason Pineda (17th round to the Padres), C Joe Donovan (33rd round to the Cubs), P Jeff Criswell (35th round to the Tigers), P Angelo Smith (40th round to the White Sox). Pineda could sign with the Padres as its not unheard of for a 17th round pick to get a signing bonus – but he does join the Padres. The other three in late rounds – Donovan, Criswell, and Smith – were drafted by their hometown teams (Donovan and Smith or from Chicago suburbs and Criswell is from Portage), which is a wonderful novelty, but they can improve upon their stock after a few solid years at school. Michigan’s 11 total draft picks tied for the most of any school in the draft with Stanford and Chipola College and is a program record, a wonderful testament to the methodology of Coach Bakich and the Wolverines. Bakich was offered the Stanford job and was in the running for the South Carolina job as well, but recently announced he will accept an extension at Michigan and will use this as an incredibly building block for recruits and the coming seasons. Those with remaining draft eligibility may return to school and have until August 15 to decide; clubs have the rights to draftees until then if no decision is made. Be on the lookout for guys like Pall, Bivens, and Hendrickson for their decisions in the near future, but until then, congratulations to all draftees and best of luck in the show!